Inbuilt Rechargeable NiMH battery pack gives 150Hrs of use. One of the biggest causes for pipe laser breakdowns is poor contact with external batteries. Super tough design, all aluminium IP67 housing, suspension mounted mechanics. High visibility angled display, readable over a distance of 5M. Fully compensated grade gives vertical alignment when rolled in the -axis. Quick dial grades, for fast setup. 2 button commands, for azimuth cantering and grade zeroing. Programmable security code, can help with lower plant insurance bills. Programmable service intervals, preventing unforeseen breakdowns. Programmable tilt function, increasing peace of mind for above ground setups. 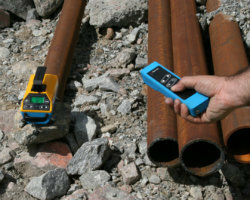 The remote control alignment function allows you to direct the laser onto a know point above the trench, without later having to use the grade setting control once more in the manhole. Set the desired grade on the laser. Direct the laser beam with the remote control onto the know direction point above the trench. Press the Standby button on the remote to return the laser beam to the original grade setting - because the laser is automatically plumb the pipe laser is now on line.